When you think of female aviation pioneers, names like Bessie Coleman, Amelia Earhart, Beryl Markham and Harriet Quimby come to mind, but did you know there’s a female aviation pioneer working in the NTSB Office of Aviation Safety? That pioneer is Beverley Drake, a native of Guyana, who is now a senior aviation accident investigator/analyst who also heads the NTSB Federal Women’s Program. At age 19, Drake left her home in Georgetown, Guyana, on a Guyana Scholarship to Embry Riddle Aeronautical University to pursue her goal – as well as her father’s dream – to learn to be a pilot. A year later, in 1977, she was back in Guyana with her wings and ratings and became one of only two female pilots flying for the Guyana army. “I flew twin-engine airplane transport aircraft in the jungle with limited navigational aids,” Drake said. The following year, she became the first woman pilot for Guyana Airways. Drake flew the Twin Otter and the Hawker Siddeley 748. In 1980, she moved with her family to New York City where she worked in finance. Determined to keep her pilot’s certificate current, she flew with flying clubs out of the Farmingdale, Long Island, airport. In 1991, Drake joined the NTSB as a transportation safety specialist. Next, she was a regional investigator and completed 300 investigations and also worked on USAir 427 as chair of the witness group and on TWA 800 reconstruction. 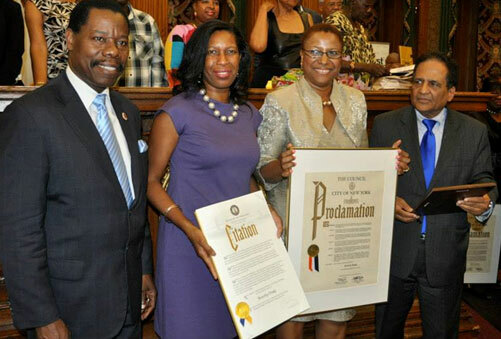 Last week, during Brooklyn’s Caribbean-American Heritage Month, Drake (pictured above, second from right) was recognized with a City of New York Citation, “The Golden Arrowhead Award of Distinction,” and a proclamation in recognition of her contributions to Guyana and aviation.